As the name suggests, the surface-set diamond bit differs from the impregnated type in that they are set with a single layer of natural industrial drill diamond on the working surfaces of the bit crown in a pre-determined pattern. Prior to 1980, surface-set diamond bits were dominant as the preferred type used in mineral exploration activities. In recent times, the use of surface-set diamond bits has diminished significantly in favour of bits that employ engineered, synthetic cutting media such as the impregnated and thermally stable polycrystalline (TSP) types. Technological improvements related to the synthesis of mesh-size diamond crystals and TSP elements have expanded the application ranges of impregnated and TSP bits to the point that surface-set natural diamond bits have become largely superfluous. 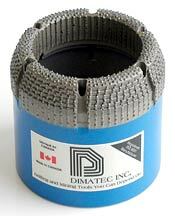 Surface-set natural diamond bits and TSP-set bits have a similar range of application. Surface-set diamond bits should only be selected in cases where TSP setting is unavailable as cutting media for a particular size of bit. Click here (Geotechnical Core Bits) for more information on TSP-set bits. The construction of a surface-set diamond bit features natural industrial diamonds that are mounted in a bit crown that is comprised of a powdered metal matrix body. This matrix body is fused to a steel tool body. Unlike impregnated diamond bits, where the controlled erosion of the powdered metal bit crown is desirable to expose new diamond crystals, the metal bond matrix used for all Dimatec surface-set bits is extremely tough and wear resistant. The function of the bit crown matrix body on a surface-set bit is to securely hold the diamonds in position throughout the operational life of the bit.